Getting your ball to hook (curl) is crucial if you’re to make consistent strikes. To achieve this movement, you’ll need to impart spin on the ball. 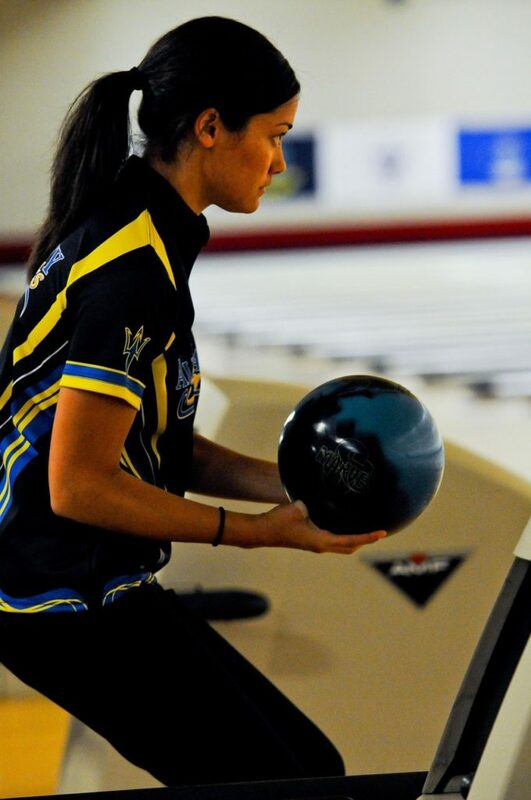 Spin is important if you’re looking to hook the bowling ball. By throwing a curling ball, you’ll be able to impact the area of maximum strike potential, known as the pocket, at the correct angle. Original diagram (since edited) by Darulo on Wikimedia. Licensed under CC BY-SA 1.0. 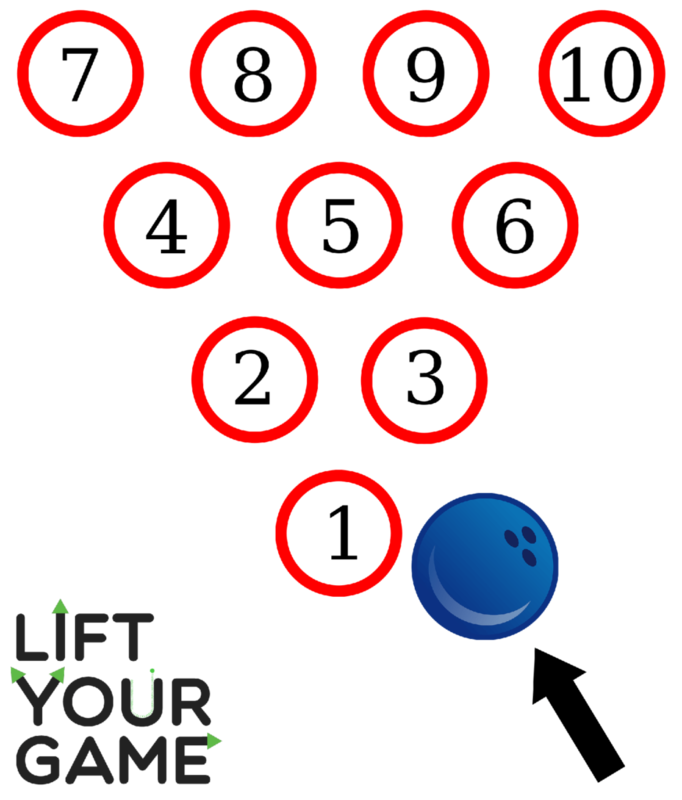 As shown in the diagram, the pocket for right-handers is located near the top of the pins. Ideally, the ball should hit the 1 pin first and then deflect into the 3 pin to get these pins to knock down other pins on both sides of the pack. For left-handed players, simply mirror the ball position and arrow. You’ll want to hit the 1 pin and then the 2 pin instead of the 1 and the 3 pin. Notice that to impact the pocket, the ball must be coming in at about a 30° angle. Therefore, you must curl the ball to achieve consistent strikes. Get a ball that feels comfortable – it’s recommended you buy something that weighs roughly 10% what you do. Most pros these days go for something on the lighter side (7%-9% of their body mass). This is because it’s the pins knocking each other over, not the weight of the ball, that results in consistent strikes. Don’t rush your throw – walk slow and steady. Keep your arm and wrist relatively straight. Make your final step as close to the foul line as possible (with your opposite foot – left foot for right-handers). Let go of the ball near your ankle just above the floor. Rotate your wrist as you release the ball towards the opposite side of your body. For right-handers, spin the ball counter-clockwise. If you’re a lefty, spin clockwise. 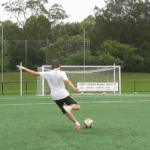 Your end goal is to achieve lateral rotations. Imagine you’re looking at a circular saw side-on: this is the type of spin you need. Grip the ball how you normally do, but don’t put your fingers too deep into the holes – use just your fingertips if you can. Your fingers need to be able to leave smoothly as you release the ball for the spin to work. Keep your thumb relaxed, and try to have it leave the ball first so that your fingers control the hook. If you struggle to release the ball in time, go for a slightly shallower grip. On the other hand, if the ball is slipping or leaving your hand before you can impart any spin, put your fingers deeper into the holes. Now it’s time to practice. For right-handers, take your final step with your left foot just to the right of the middle of the lane. This gives the ball some space to hook back in towards the pocket. Avoid trying to use too much spin as this can make it hard to throw consistently – see what feels comfortable and adjust your throw position to the left or right accordingly. Once you’ve got the basic technique down, keep practicing so that your accuracy improves. Help! I still can’t spin the ball! 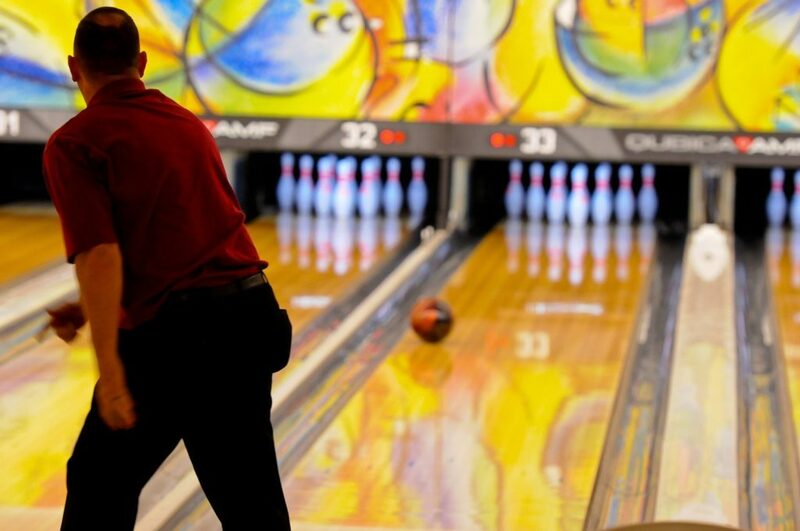 There are a few possible reasons you’re having trouble curving the bowling ball. Too little spin: if you struggle to impart lots of spin, try and flick your wrist a bit more as you release the ball. Ensure you’re spinning the ball laterally, like it’s a spherical circular saw. Wrong bowling ball: cheap, plastic house balls won’t spin very easily. You should try a urethane, reactive resin or particle ball – these are what the pros use. Also, check that your bowling ball isn’t too heavy: it shouldn’t weigh more than 10% of your body weight. Slippery bowling ball: bowling alley lanes are covered in oil, which is why they’re so easy to slip on. After extended use, your ball can absorb some of this grease, preventing it from gripping the lane and hence making spin impossible. Try and use a bowling ball cleaner or get a pro shop rejuvenation if your ball is dirty. Improper technique: it can be really hard to master the hook technique. If you’re having trouble, do some practice with a tennis ball. Grip it with your fingers, and try to impart spin with an underarm throw. If you can get the ball to deviate significantly to the left or right after it bounces, you’re on the right track. Remember, practice makes perfect. Don’t give up – this is a very difficult technique to master, but it’s definitely worth learning! If you’re still struggling to throw with spin, leave a comment and we’ll see if we can help you out.